For the animal in Grand Theft Auto V, see Mountain Lion. Cougar is a character in the 3D Universe who appears as a minor character in Grand Theft Auto: Vice City. He is a member of the Biker gang in Vice City and appears to be a higher ranking member of the gang. He is voiced by Blayne Perry. Cougar, at an unknown point in time, joined the Biker gang and proved proficient at illegal street racing. He and Zeppelin, in 1986, are asked by the gang's leader Mitch Baker to race against Tommy Vercetti, who was looking to prove himself. 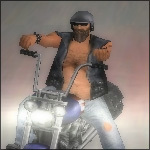 Cougar, a skilled biker, later tells Baker about Vercetti's abilities after he won the race. Cougar and Zeppelin may have provided security for the Love Fist concert, although this is not shown in the game. This page was last modified on 26 November 2014, at 02:50.